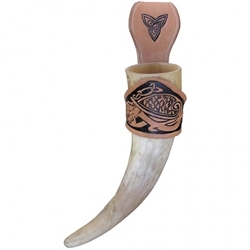 Our Leather Drinking Horn Carrier Deluxe is an even better way to carry your drinking horn. Comes with intricate Celtic knotwork design. Drinking Horn Not Included. Holds horns with a diameter of app 2"